We’re so excited. We just upgraded our favourite paratha! We spent the previous week in the States and dropped by Chicago for a few days to explore the city and try out their trendy food spots. One cute little diner you must visit if you’re ever in Chicago is the Little Goat Diner. (Their mascot is a baby goat! Aw.) They’re known for their Fat Elvis waffles – humongous waffles topped with banana, peanut butter, bacon and maple syrup. Of course, we had to try them and they were glorious. Luckily we don’t own a waffle iron, or the heading to this post would’ve been “Fat Elvis Waffles and Now Get Us to Accident & Emergency”. But under the heading “Cereal Killers” (brilliant) the menu also advertised “parathas burrito”, made up of “Indian flatbread, sunny side eggs, avocado-bean salad, chilli pepper sauce and sheep’s milk cheddar”. Whenever something Indian comes up on a non-Indian menu, we always think “OH REALLY BRING IT” (because we’re naturally confrontational) and have to try it out. And you know what, it wasn’t bad. Okay, it was amazing. It was everything we wanted. Comforting and carby, healthy and proteiny. And it inspired us to make our own version which is even more of a compliment! Our version involves a larger paratha studded with ajwain (carom seeds), filled with much more spicy mashed potato and pan fried in butter (yum). 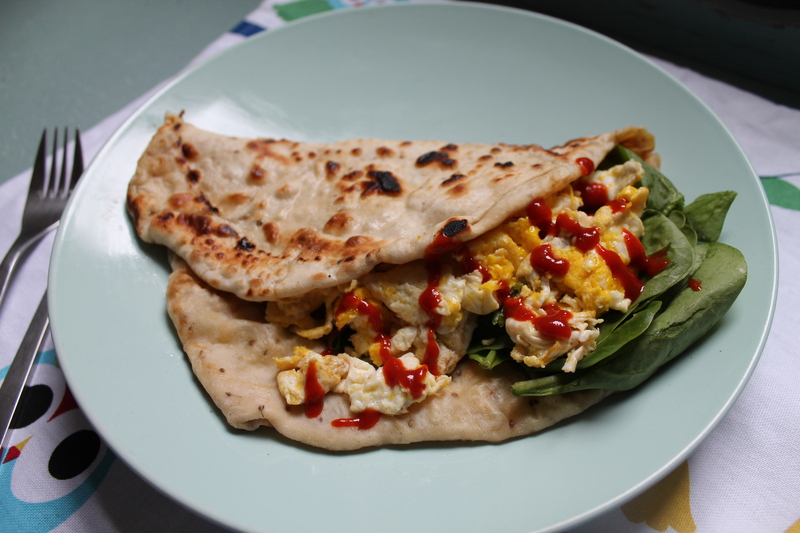 Then we fill the “burrito” with scrambled eggs, spinach and Sriracha sauce for a low-key but super delicious breakfast or brunch! Mix the paratha ingredients together in a bowl to form a ball and knead for a minute to form a soft dough. If the dough is too dry, add teaspoonfuls of cold water until you are satisfied. It shouldn’t be too sticky! Cover with a tea towel and leave aside for 15 minutes. Meanwhile, make the mashed potato. When slightly cool, add the garam masala and salt and mix thoroughly. Then, on a floured surface, roll out the dough into a large circular shape. Try to get the dough as thin as you can without forming any holes in the surface. Add all of the mashed potato mixture in the centre of the dough. Fold the dough over from the top, then the bottom, then the sides – sort of like an envelope. Gently roll out the dough into a large circular shape again. 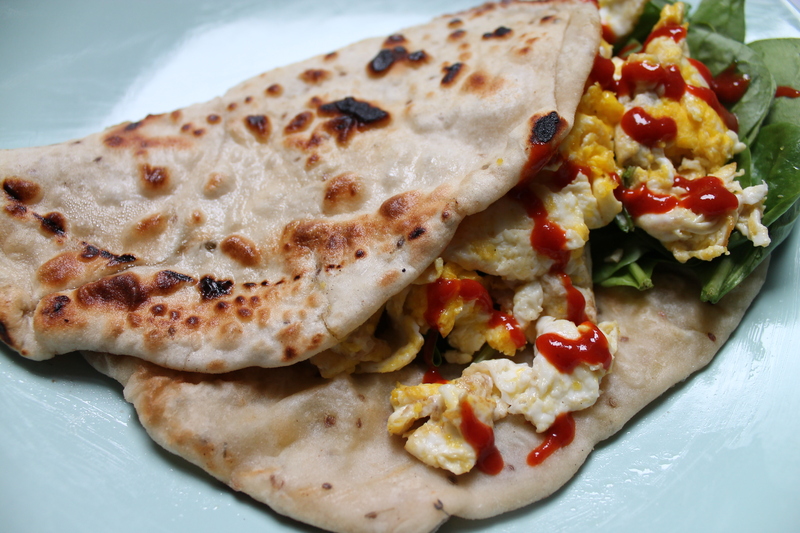 Put the paratha on a plate, add the scrambled eggs, spinach and chilli sauce – and enjoy!